Winter holds on in February, but its grasp softens through the month as icy landscapes begin to subtly turn toward spring. Garden tasks include finalizing our plant orders, checking storm damage, watching drainage patterns over frozen soil after snowmelt or winter rains, and dormant season pruning. Whether you are planning a small garden or planting a larger acreage, it is always important to match plants or seed mixes to the appropriate site. Soil tests, observations of which species grow well on the site, shading, and factors like slope, aspect (which direction the site faces), and drainage can help determine which set of plants will be most successful. Last year’s above average cumulative rainfall and flooding events highlight a role for more rain gardens in our landscapes. Flashy storms on impervious surfaces lead to overflowing catchment basins. Rain gardens or vegetated basins intercept runoff, hold it as it infiltrates through porous soils created by extensive root growth. Both of our native plant rain gardens functioned well during and after the August 20 flood. FOA is offering two rain garden mixes in the advance order sale—one flat of 32 small plants for full sun or light shade, and the other flat of 12 larger plants for shadier spots (not deep shade). The rain garden mix for sun includes short to medium-sized flowering species for season-long bloom, such as southern blue flag iris (Iris virginica) in early season, bee balm (Monarda fistulosa) and culver’s-root (Veronicastrum virginicum) in mid-season, and New England aster (Symphyotrichum novae angliae) in late season. These plants will attract many pollinators as well. Fox sedge (Carex vulpinoidea) will provide structure and support for the forbs—it is a perennial sedge about 2 ft. tall with a rounded shape and distinctive seed heads. 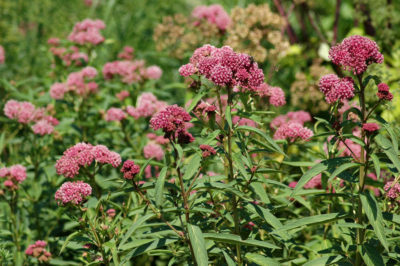 The shade mix includes shorter and taller plants that will spread through the garden by seed (e.g., sweet Joe-pye weed, Eutrochium purpureum) or rhizomes (Canada anemone, Anemone canadensis, and ostrich fern, Matteuccia struthiopteris). Shade can be challenging in the garden, as varied conditions fall under that simple descriptor. The amount of shade, even under trees, varies with tree species, shape, and size. Conditions on the north side of a building can mimic shade even if no trees are present. Scattered trees may cast only light shade on a south or southeast facing slope. Shade garden plants in this year’s mixes include ferns, spring blooming flowers, forest groundcovers, and accents. To support pollinators and wildlife in sunny areas, another garden mix includes plants 2–3 feet tall with profuse flowers blooming in sequence throughout the season. Little bluestem (Schizachyrium scoparium) provides structure and fall color in this mix. FOA is accepting advance orders for these native plants through Feb 14. In addition to the mixes above, you can order native trees and shrubs, ground covers, and half or full flats of native wildflowers and grasses. Your advance orders will be available for pickup at the Arboretum on May 9, just a few days before the tent sale on May 11. During the beginning of winter’s end, plan a new garden area or discover a few new plants to add to your existing plantings.